Director of the Bureau for Employers’ Activities (ACT/EMP) in the ILO. 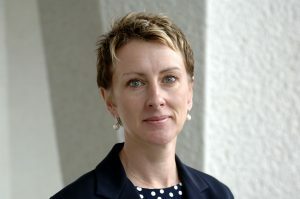 As Director she is responsible for a global team of professionals who provide the link between the ILO and its business constituency and seek to ensure business and employer policy issues are reflected in ILO work at policy, technical assistance and governance levels. The Bureau works direct with employer and business representative organisations worldwide on their organisational strategies and development. Prior to joining the ILO, Ms. France-Massin was Deputy Secretary General of the International Organisation of Employers (IOE) in Geneva. Between 1997 and 1999 she worked as a human resources consultant for a number of multinational companies with particular emphasis on global HR strategies and negotiating European Works Councils agreements. From 1989 to 1997 she was Head, International Social Affairs with the Confederation of British Industry (CBI) where she was a member of the Business Europe Social Affairs Committee and participated in a number of European level social partner negotiations. She was chair of the BIAC (Business and Industry Advisory Committee to the OECD) Social Affairs Committee. From 1995 to 1999 she was an Employer titular member of the ILO Governing Body and a member of the Committee on Freedom of Association. Between 1985 and 1989 she worked in commercial and human resources management with large UK retailers. She has a BSc from the University of Manchester and a Postgraduate Certificate from the Institut d’Etudes Politiques de Paris. Today, workplaces are evolving at unprecedented speed. Advancements in technology have an effect on workers and businesses in developed and developing economies alike. We are changing not only where and how we work but also the skills necessary to succeed and the type of jobs available. Technology brings both vast opportunities and critical challenges for women. So how about just taking a moment to look at where we are? The ILO’s global report, Women in Business and Management: Gaining Momentum (2015), shows that women have been an engine for global business growth and represent a key talent pool for companies. In some instances, women occupy more than 50 per cent of jobs in junior and middle management. Yet the view from the top is very different where only 5 per cent of publicly traded firms are led by women. A regional ILO report that examines the impact of technology in South East Asian countries, highlights the particular gender aspects brought by advanced technologies. Many traditional roles that are susceptible to technological disruption or displacement are disproportionately occupied by women (e.g. administration and sales) while they are underrepresented in those occupations and sectors that are set to grow (e.g. engineering and computers). Our research shows that key sectors in Asia where a significant number of women are employed such as garment and retail trade are at high risk of automation. In particular, the highest odds for women are in the Philippines and Viet Nam, where their probability of being at high risk occupation is around 2.3 to 2.4 time as high as their male counterpart. Critically, more women need to enter traditionally male-dominated occupations that are projected to grow due to technological advancements if they are to advance into leadership positions. In doing so, we urgently need more women studying STEM subjects. Our global report shows that while the number of women studying engineering and manufacturing have increased in a significant number of countries, women still rarely make up more than 30 per cent of graduates. Social interaction, communication and empathy are extremely difficult for machines to emulate and these are qualities conventionally featured more prominently in women. As such, care and service industries where women tend to thrive remain largely unthreatened by technology advancement, making women an even greater asset to labour markets of the future. Technology and the workplace of the future bring many opportunities for levelling the playing field for women. Here are a few examples. Balancing work and family duties is cited as one of the biggest barriers to women’s career progression. Technology can help overcome this hurdle. 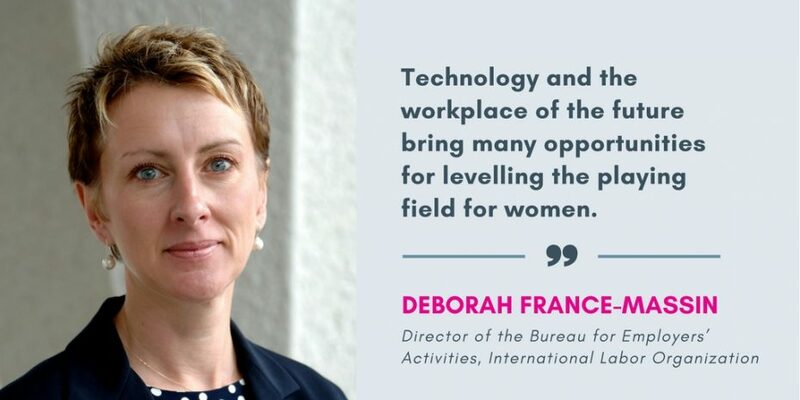 Today’s digitalized technology facilitates more work to take place anywhere at any time, allowing for flexible working arrangements to become a key enabler for women to continue their career. Clear evidence can be seen in a traditionally male dominated industry: a Jordan-based consulting engineering firm, Handasiyat.net, received an overwhelming number of women applicants as it enabled women to work from home as engineers. Lotte Card of the Republic of Korea also boasts an impressive 80 per cent return rate after childbirth or maternity leave due largely to their flexible working options. However, without a company policy and culture to match, flexible working arrangements can also hinder employees. Performance evaluation must evolve beyond “face-time” measures to avoid penalization of those that exercise flexibility. We also see that technology is empowering women in the workplace through access to information. For instance, women’s access to information on company’s gender policies and practices, company cultures, and pay scales has increased significantly through websites such as Glassdoor and The Muse. Companies that provide a level playing field and equal pay for work of equal value, perform better. Lack of leadership training is a key barrier to women’s career advancement. Here again, technology, more specifically online training courses, provide a highly scalable, low-cost solution. Online training could be applied to re-entry programmes and professional development to ease the transition for women returning from career breaks or maternity leave and increase retention. For example, Singapore’s WorkPro initiative provides fully funded training programmes and promotes flexible working arrangements to help women return to the workplace. The glass pyramid, confining women to specific functional roles usually based on gender stereotypes (such as human resources), prevents women from gaining the breadth of experience necessary to advance up the leadership ladder. Given the impact that technology is having, and likely to have, on displacing business functions where women predominate, the skills of talented women need to be broadened. While technology offers much opportunity to enable women to overcome leadership barriers, technology-enabled flexibility and training are not a silver bullet solution. A greater diversity of measures such as equal pay for work of equal value and maternity and paternity leave are necessary to level the playing field. Each company should take a careful, measured look at their gender diversity and plot their own, tailored journey towards gender parity. In doing so, they can tap into representative business membership organizations (BMOs) for advice, tools and good practices on why and how to promote women in leadership. Importantly, as advanced technology becomes more prevalent and transforms workplaces, companies should communicate their new skills needs to BMOs who can work with education and training institutions to equip women with critical skills required in future workplaces.